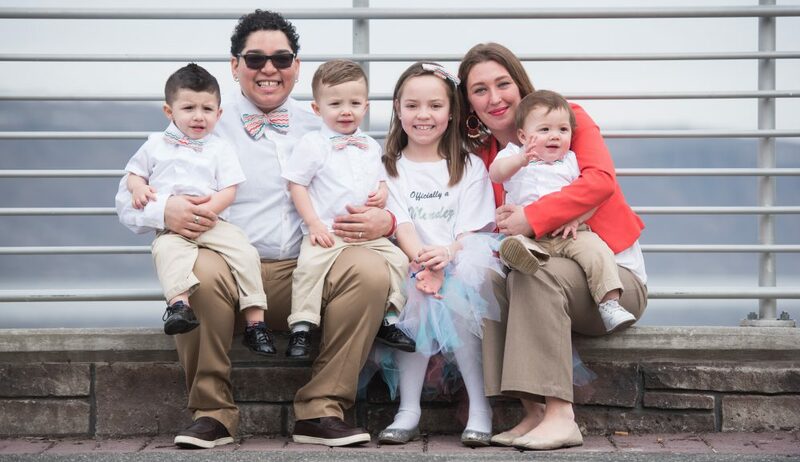 This entry was posted in Uncategorized and tagged Adoption, changes, dos mamas, Foster, foster family, foster parents, lgbt family, LGBTQ parenting, rainbow family, two moms by Sammie Mendez. Bookmark the permalink. Thanks! The pre-teen stuff though! Good grief! If this is how it starts, lets just fast forward to her graduating high school because….I CANT! And my wife and I, in every sense, total opposites. I try and tiptoe aroudn the mess but MY WORD is it a lot! And anyone who has been to my house (Chime in Nikki cause I know your reading this!) knows the madness! It’s literally the ONLY thing that I just really can’t compromise on, but also, OCD so, ya know! LOL! Oh, this was DEFINITELY meant to be. It breaks my heart to imagine what he’s gone through or how he hadn’t experienced love – he’s in the BEST place to get attention and love in your home. Good luck on these adventures! You guys are amazing! He is already so, so loved! First thing Noah does in the morning is storm into our bedroom, stick his hand in the crib, rubs Lil’ R’s arm saying, “Good morning Baby R! Mama, that’s my baby R!” SO much love for this little one! Thanks friend! I wish I could like this post 1000 times. You are such a beautiful person and you have a beautiful family. The sadness over this baby boy’s neglect is totally overshadowed by the love you are going to give him. I guess now IS the time! IT couldn’t be a better time! New house, Callie’s promotion, potty trained Noah, two minutes from my mom, my sister, and my other sister! The time couldn’t have been more perfect than right now! Perfect is a tough word for me, but this is pretty damn close. This is amazing and so are you all. That little guy is right where he needs to be for however long that may be. Wishing you all the love that there is! Thanks, friend! Miss seeing your family now that I haven’t been on FB in about a year. Hope you all are well! Wow! This is so amazing! My heart broke when you said he doesn’t really cry, but I know you will show him all the love in the world. You said temporary, but could it become permanent? 🙂 🙂 🙂 So excited for you – and the baby too! Should be good! Thanks, friend! So, our kids are almost grown. 9th and 10th grade this year. J and I have talked about having another and then we decided we loved our alone time. Immediately after reading your post, I told J that You changed my mind again. ☺️ So happy for you and so thankful the little one has a loving family now. Wow! You’ll have college kids before you know it! Seems so far away, but it feels like just yesterday Mariah was in kindergarten and she’s on her way to middle school next year! Yikes! This is totally my favorite news today! Except for Shawni and Cade’s baby. Ok. It’s a tie. Hahah! I know! I was all, “Yassss! New baby for you too! SWEET!!! !” Lol! Thank you! And that’s 4 under 3, who I sounds even freaking crazier! Lol! ugh I just love you guys, this is just beautiful! Also that second paragraph about hoarding was classically written! LOL I totally understand. I love that story 😊 Love you guys! You ladies are amazing and inspirational on so many levels. R is a lucky little boy. Gah! Huge news! I can’t wait to hear how things go with this little precious addition. Love on that little guy hard! Also Em and I have been going to biweekly therapy forever and find it so helpful in just keeping us connected and even just forcing that little bit of time to focus on our relationship rather than momming, work, etc. It’s all about trying to understand each others’ blueprints for relationships and life! Oh wow. Wow. I’m not one for fate and destiny, but…the universe has its eye on you, doesn’t it? And, lest it get lost in the excitement of toddlers, tweens, and tinies, props to you for doing the hard stuff in relation to your marriage. I love this post. I am so, so glad that you and Callie were there for R and he was there for you. You are a family of superheroes. ❤❤❤ I so knew where this was going. All the best friend!! Yay! You know that I’m still catching up on posts? I follow you on Instagram so I’m not totally out the loop. What an amazing testament to the wonderful people you and your wife are. Such loving parents and I know this boy is blessed even for a short time with you, your wife and the kids.